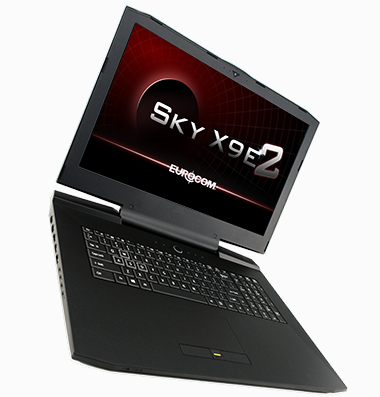 A beacon of power and performance, the Sky X9E2 is the most powerful laptop in the entire world. This unlocked, upgradable powerhouse is designed with one core value in mind: freedom. Freedom to choose what components you want and the freedom to overclock your CPU and GPU(s) to get the most out of your system. For freedom in gaming, rendering, and whatever else you throw at it, the X9E2 will run the most powerful graphics array of any laptop in the world: up to two desktop MXM 3.0 NVIDIA GeForce GTX 1080 graphics cards in SLI. With up to 64GB of DDR4-3000 memory, and room for up to 4 hard drives (two M.2 slots (NVME) and two 2.5 inch drives, for a maximum storage capacity of up to 12 TB), this beast will do everything you wish your desktop could do. But don’t worry, all of your data will be kept secure with the X9E2’s Kensington lock, biometric security, and Trusted Platform Module (TPM) data encryption. TPM encrypts all your data so only you have access to it, even if your machine is misplaced or stolen. All of the components are kept cool by a state-of-the-art thermal solution comprised of industrial grade, copper heatsinks, powerful centripetal fans, and a layered modular, socketed motherboard system designed to ensure maximum thermal efficiency. The motherboard’s design allows you to upgrade to the latest GPUs and run them in SLI as you sit in dominion over your subjects! Effortlessly run the latest games on extreme settings with up to two desktop NVidia GeForce GTX 1080s in SLI. Overclock your GPUs and Intel i7 6700K or 7700K CPU while Eurocom’s industrial-grade thermal solution dissipates the heat and your opponents flee for their lives! Get killing sprees like never before with a Full HD or QHD, 120Hz, G-Sync panel for the latest FPS, or explore untold worlds in their boundless beauty with an UltraHD 4K display. Whatever you choose, glory awaits you!